Giant Pumpkin Growing Tips From The Pumpkin Man: 1685 "Cujoe" Pumpkin is Trying to Beat Out "Jumbo"
1685 "Cujoe" Pumpkin is Trying to Beat Out "Jumbo"
Took a measurement on the 1685 pumpkin just now. Haven't measured it in nearly 3 weeks. I was considering taking it off the vine this Friday, but I may hold off on that. Its estimated weight is greater than the 747 pumpkins, but I don't believe it will actually be heavier. For one, its shape is one that tends to go light. Also, before it turned into a satellite dish that fell over, I had another pumpkin on the vine that I decided to take off because it was growing slow. It came in about 10% light, so I suspect this pumpkin will go light also. This pumpkin has to be right up there for one of the strangest looking pumpkins I've ever grown. Because of the bird bath shape I haven't posted any pictures of it for a long time because it has been under a canopy structure and it is hard to take off because I had to sire the tarp onto it in order to keep the strong winds we have from blowing it away. 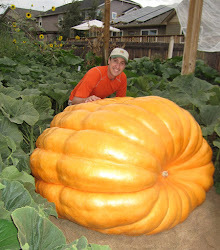 The cross for this pumpkin is 1685 x 747, which basically translates to a whole lot of 2145 genetics crossed with a whole lot of the 2009 genetics. So it is an relatively interesting cross. Have no idea what the progeny would look like. I suspect a bit orange, but the shape would be a mystery, because each side of the cross is so different.